That last part might make the insurance carriers perk up their ears. The patients might dash back to the doctors’ offices because the word is getting out that doctors are helping people without side effects. Notice also, the dates on these articles and references – these things were known decades ago. He felt that the rapid spread of the virus to the brain tissue was similar to the speed of the onset of the symptoms after a severe head injury: “… a margin of safety is so narrow that life and death are separated only by minutes.” There is no time to wait for the laboratory results. Others – Massive doses for rheumatic fever. 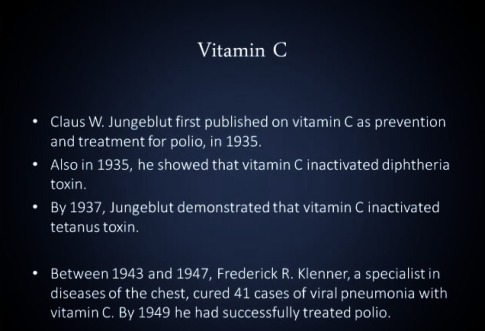 C will cure TB by removal of the organism’s coat. Also pneumonia—(so it does not matter if one has a viral or bacterial pneumonia, it works). I’ve insisted on at least 3g plus a healthy diet….but who knows? Did I pick my parents well?